Why did you decide to do this project? I ran a poll – completely unscientific – in conversation I have been asking the question for the last 4 years. "Did you know Mrs. King, Martin Luther King, Jr.'s mother, was shot, murdered, assasinated? 99.9 percent answer NO! June 30th, 1974, Ebenezer Baptist Church, Atlanta, GA. Sunday Service – Mrs. King at age 71, was playing The Lord's Prayer on the organ and a crazy man from Ohio walked in and shot her dead! This should be common knowledge. AND this is the tip of the iceburg. I am so surprised every day at the amazing lives women have lived. So the saying "Women are written out of history." It is true. And so we need another way to look at the events of the world – "Her-story!" Maya Angelo spoke of "she-ros" So, I say as many others Her-story. How has doing a yearlong/daily project affected your life? This blog has profoundly affected my life – it is over-whelming at times. But, it is also – thrilling, amazing, exciting, and I am brimming with ideas and stories – I have been writing a play about it. "Mrs. King was Shot!!" And each day I drift off to this world of mystery- because women are so left out – it is has the excitment of uncovering past. And hopefully I am helping to make the future aware of her past. Another woman who amazed me- August 3rd, 2006. 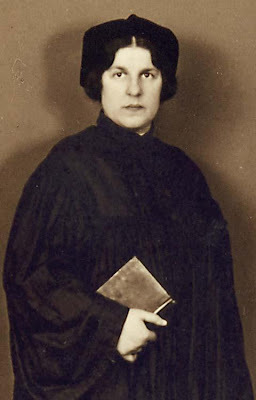 I was searching and came across, "First female rabbi born this day in 1902, Regina Jonas." So, I followed the trail. Rabbi Jonas was ordained December 25th 1935 in Berlin Germany. I could not find a lot on her, but there was educational book that was published in 2003-ish in Germany and I ordered it. Regina Jonas was an amazing human being. Like Mother Theresa. I just Googled her and now she is all over the place! But, in 2006, my blog was one of the first sites that popped up about her. So, I have an idea that the blog helped put her-story on the map. Rabbi Jonas is in a ton of blogs now. And that thrills me. The impetus for writing it was to support a performing arts group called The Women's Mercury which was founded by Bridget and her partner Keri Wormald. Learn a lot more about "her-story" on her blog HERE. Noah, Thank you. You are one of those amazing humans, and I am honored to know you! Really. I recall our un-planned train ride to NYC, 2 weeks after 9/11. The train was pretty much empty. And as the NYC city scape came into view and the twin towers were gone. And the streets were quiet. And I went off to my friend's apartment and you to yours. Fond memory.